This program is in place for the elderly population who live alone to phone in each morning and let the communications officer know that they are okay. If they fail to call, an officer will be sent to their home to check on them if they cannot be reached by phone. To sign up for this program (at no cost), simply contact the Sheriff’s Office at 276-773-3241. This program is aimed at the student population in the school system. Students are taught the dangers of drug use and ways to say “No”. This project is in place so that parents may bring their children to the Sheriff’s Office to have them fingerprinted. Special finger print cards are available at no cost for this valuable record. Grayson County School Resource Officers teach “Class Action,” a law related education course which instructs high school students in areas such as character, responsibility, and respect for others. 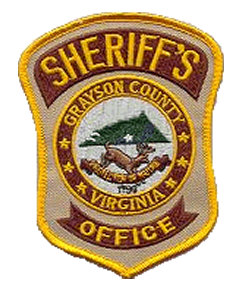 The Grayson County Sheriff’s Office is proactive in it’s crime prevention efforts and coordinates many community services and crime reduction education programs. The Grayson County Sheriff’s Office is also responsible for conducting home and business security surveys; managing the Neighborhood and Business Watch Programs, and being invovled in many community events and seminars. This free service is offered to all Grayson County residents. It allows a home owner the peace of mind that their property is being watched while they are out of town. A deputy will check your home at least once every day while you are gone. You can request a house watch by calling 276-773-3241. An Operation Kids trained deputy will inspect and install your child saftey seat for you. The deputy can also check your particular safety seat model to ensure that it hasn’t been recalled by the National Highway Traffic Safety Administration (NHTSA) for potential safety concerns. Project Lifesaver helps provide rapid response to save lives and reduce the potential for serious injury for adults and children who wander due to Alzheimer’s, autism, Down syndrome, dementia and other related cognitive conditions. Contact Karen Smith at (276) 773-3241 if you would like more information on this program. The chances of your child being a victim of an unspeakable crime are unlikely. However, it is important to take every precaution available to ensure their safety. The Grayson County Sheriff’s Office will assist you with the completion of a Child Identification Kit at no cost to you. A completed child identification kit, which should include fingerprints, a lock of hair, dental records, and a recent photo, can make it easier for law enforcement officers to find missing children.